Popguns and peashooters are for experts! Mid-bores and magnums are for women, youths and novices! If these statements seem to contradict traditional shooting wisdom, then please “bear” with me. 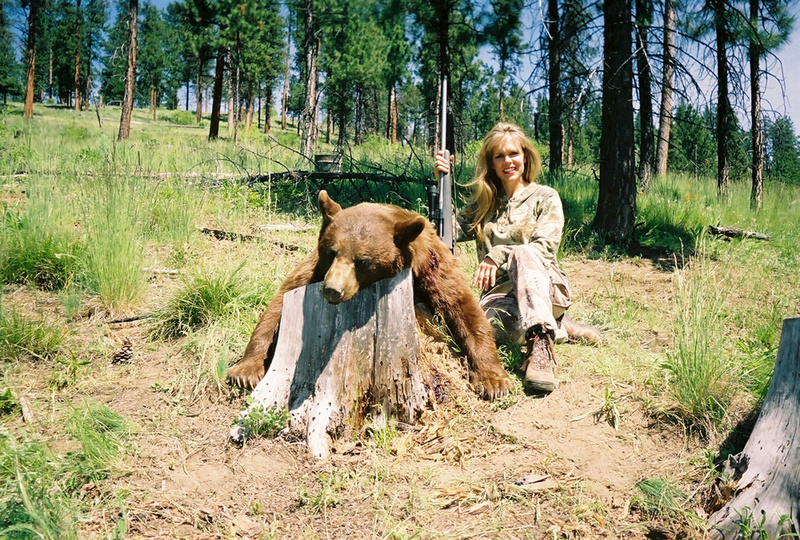 I shot a black bear this past spring. Actually, my “black bear” was brown with a thick coat of glossy chocolate fur, paws resembling small dinner plates and a bulbous head the size of an over inflated soccer ball. A subsequent tooth analysis indicated that he was approximately twelve or thirteen years old, and we estimated his live weight at more than 350 pounds. By Idaho standards, he was a pretty good bear. The shot itself was nothing remarkable; one hundred and sixty two laser measured yards, from a solid bipod rest, across a steep narrow canyon. When I pulled the trigger the bear had been standing in a classical broadside pose quartering slightly towards the rifle. The 180 grain ballistic tip bullet from my custom .300 Winchester magnum struck the bear perfectly on the leading edge of his front shoulder, plowed rearward through both lungs and came to rest just under the hide near the last off-side rib. Considering the precise bullet placement and the fact that he fully absorbed over a ton and a half of kinetic energy, you might well assume that this old Elk calf connoisseur dropped on the spot. But, that would be a very incorrect assumption! In actuality, super smokey took off like a racehorse coming out of the starting gate at the Kentucky Derby. Incredibly, he then proceeded to run 80 or 90 yards at a full flying gallop before collapsing out of sight in some rather tall dense brush. Since the bullet failed to exit his body there was no readily observable blood trail. And, as anyone who has ever tracked a bear can attest, fur covered paws leave little evidence of their passing unless there is sand, snow or mud present; which, in this case there was not. Fortunately, due to my excellent cross canyon vantage point I had little difficulty finding my prize. However, with just a few minor variations in this timeless hunting scenario things could have turned out decidedly worse than they did. Now, lest I give the false impression that I am advocating a “solid” firing .460 Weatherby Magnum for every greenhorn, woman and child, I believe a brief and somewhat rudimentary discourse on bullets may be advisable. First, we must remember that no matter how large or powerful a given cartridge is, it is exclusively the bullet that does the work!!! The magnitude of this basic fact cannot be overstated, and we must fully comprehend that once the trigger has been pulled “everything” rides on the performance of that little piece of spinning metal. Second, we must understand that unlike mankind, not all bullets are created equal. Bullets come in almost infinite degrees of “toughness.” They run the gamut from being very fragile and frangible, to being extremely tough and non-frangible. Consequently, even though a specific bullet may be the correct caliber, weight and shape for a specific cartridge, that most assuredly does not mean that it is the correct bullet for use on all game in all situations!!! Absolutely not!!!!!!!!!!! Third, while it is undeniably true that precise bullet “placement” supersedes bullet “performance,” overall bullet performance is so critical that a marginal hit on game with a well chosen, well constructed bullet may in fact be much more effective than a perfect hit made with a poorly chosen, poorly constructed bullet. Fourth, while we could easily achieve our complete “pass-through” mandate by using extremely “tough” non-expanding type bullets, we must acknowledge that for effective one shot kills on most non-dangerous thin skinned game, varying degrees of bullet expansion is both desired and required. Fifth, although there have recently been some major advancements made in bullet performance technology, we must still clearly understand that even the very best hunting bullets only perform optimally in a fairly narrow range of circumstances. This means that while contemporary “premium” bullets cover a wider range of applications than ever before, it is still vitally important to match the bullet / cartridge combination to the situation, size and tenacity of the game being hunted. Finally, without becoming too technical, we need to understand a pair of imposing terms that are directly related to a bullets ability to penetrate, retain energy and efficiently take game. These simple but frequently misunderstood terms are sectional density and ballistic coefficient. Obviously, since a bullets diameter in any given caliber is fixed, the only factors that can be altered (besides material and construction) are its weight, length, and profile. It should be equally obvious, that as the weight of a bullet increases, its corresponding length also increases. (The extra weight / material is displaced longitudinally.) Therefore, assuming similar profiles, bullets that are longer and heavier (within their respective caliber) typically have higher sectional densities and ballistic coefficients than shorter, lighter bullets. This means that all else being equal, longer and heavier bullets tend to hit harder, penetrate deeper and retain more weight after impact. (Remember, they start with more mass.) It also means that they fly “flatter,” wind drift less and retain more energy at extended ranges; the first three qualities being attributed to their higher sectional densities, the latter three due to their higher ballistic coefficients. All of which is just a grandiose way of saying that longer, heavier bullets (assuming equal velocities, material and construction) are much more effective at cleaning taking big game animals than smaller, lighter bullets!!!! typically thrust upon them by well-meaning men who carry bazookas when “they” hunt anything larger than ground squirrels! In the critical moment of decision, the average amateur has enough to think about without contemplating the additional limitations inherent to most bantam sized cartridges. True, proper shooting fundamentals and correct bullet placement must be addressed regardless of the size or caliber of the cartridge being used. 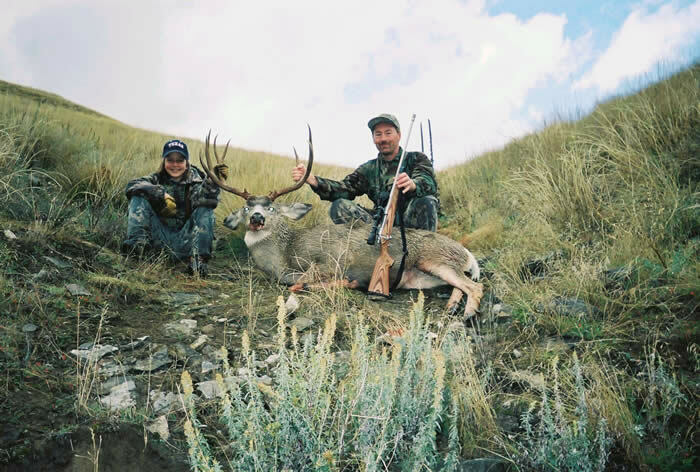 But, should the success or failure of an entire hunt be determined by a non-experts ability to surgically place a tiny, fragile, underpowered bullet “between” the ribs of a trophy bull elk? Aren’t the skills, knowledge and stress required to hit that big bull “somewhere near the center of his chest” enough?! Is it really necessary to further handicap little 12 year old Sally with a popgun cartridge that is barely adequate for malnourished three legged coyotes, and then, when that 800 pound bull steps out of the timber, force her to differentiate between an effective lower lung shot and a disastrous, wounding shoulder shot? I think not!!!!!!!!! With the relatively recent advent of “super effective” muzzle breaks and “wonder material” recoil pads, the age old argument of trading “knock down power”* for reduced recoil is a thing of the past. Finally, it is possible to have a “hard hitting” rifle that doesn’t hit you hard. For less than two hundred dollars (plus installation) nearly any rifle, old or new, can be fitted with a highly efficient muzzle brake / recoil pad combination that will genuinely reduce the “felt” recoil of most cartridges by nearly half!!!! This means that it is realistically possible (in equal sized guns) to have a powerful .300 Winchester Short Magnum that kicks like a .243 Winchester popgun! 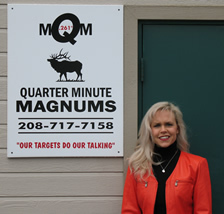 Which absolutely begs the question: Why then, would anyone (man, woman or child) want to hunt with a popgun? I honestly couldn’t say. Perhaps, they have some malnourished three legged coyotes lurking about. The phrase “knock down power” is a common but technically incorrect term used to convey the immediate lethality of a cartridge. Despite Hollywood propaganda, bullets do not knock animals or people down.